Power select FUJIFILM digital cameras with this NP-95 Lithium-Ion Battery Pack. It features 3.6V of output power, 1800mAh of capacity, and a power rating of 6.48 Wh. The battery is included with the compatible cameras and is offered here as a spare or replacement part. Box Dimensions (LxWxH) 2.8 x 2.1 x 0.6"
NP-95 Lithium-Ion Battery Pack (3.6V, 1800mAh) is rated 4.7 out of 5 by 51. Rated 5 out of 5 by Pourio from Does what it needs to do I got the Fuji X100T and not wanting to be stuck in a spot where I run out of juice outside, I wanted to play it safe. And it has already paid dividends. I must recommend getting the name brand batteries over 3rd party (just in general) because they tend to carry more juice. Especially if you're going to travel and you're unsure on power/outlets/etc it's best to be safe than sorry. I'd recommend buying a few extra (I always carry at least 5 with me when I'm traveling and so far, every time I travel, I've come to at least one time when I needed all 5). Rated 5 out of 5 by Chuck S. from So Far So Good Bought this to replace my previous replacement battery for my X100T. Charged fine, I see no reason not to award this little package 5 stars. I expect it to return the favor by not leaking, powering my camera when called on to do so and keeping its vinyly outer covering intact until its time comes to be tossed. Rated 5 out of 5 by Eb from An extra battery pack is essential! I have the extra battery charged and I carry it with me. Easy to not feel constrained and limited by the duration of the event or the number of pictures to be taken. I will get a third one if I ever start doing events in a serious way. Folks were talking about the pack from @ was not a Fujifilm proprietary pack; I can't speak on that, but I know there were enough bad reviews stating that to make me order this pack from BH-Photo. This is the exact same batter by looks as the one that came with the X-30. Rated 5 out of 5 by Roger from Original Equipment Battery This battery works fine. 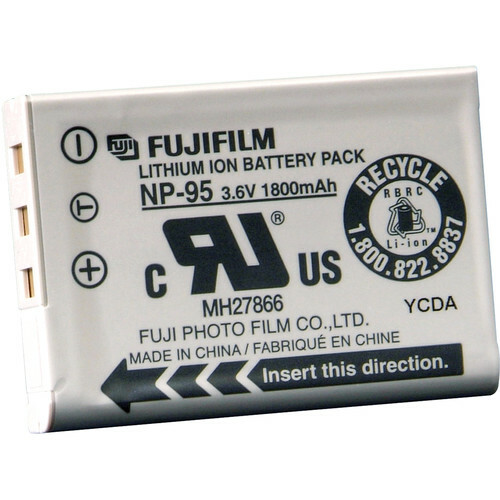 By the way, several Fuji reviewers have commented on short battery life with Fuji cameras that use this battery. That has not been my experience. If you want good battery life, just read the directions and set up your camera to not be an energy hog, don't shoot much video, and cut down on the number of shots you take by thinking more before shooting. Rated 5 out of 5 by Wabo from Buy the real thing! When I went to the store I already had two generic batteries and one FujiFilm battery. I went in and bought an extra one for my long days shooting. (they don't last very long in general.) Definitely noticed a huge difference in holding charge in cold weather and many hours/days after original charge. Don't waste money on the generic batteries! Rated 5 out of 5 by Galo G. from OEM spare battery Battery is modestly over-priced, but work very well. Average charging time, but last a long time in the camera - Fuji X100t. On another note, here is a gentle warning concerning purchasing this item or any others. At the time I placed some of my purchases, there were 4% rewards offered. This is 1 of the reasons Ive made some purchases. Upon waiting the allocated amount of time without receiving the 4% rewards, I reach out them via chat and phone only to be told these purchases do not qualify. Im very disheartened that this was not resolved in an honest mater since I am certain it was listed on the website during checkout. Ive done a price comparison at 3 different stores comparing the items Ive purchased since the beginning of the year and all are about the same price. I will unfortunately start looking elsewhere for my purchasing needs due to this dishonest practice. So this may be one of my last few reviews of some products Ive purchased here. Take care and keep shooting! Rated 5 out of 5 by Azuree from Great Battery I recently purchased a Fuji x100T and as most people say the battery life for these little guys is dismal. I needed a second battery to have with me on trips. Having two def gets me through a day or two of shooting! The battery comes with a nice little plastic sleeve to store it in, which I appreciated. Rated 4 out of 5 by Chipsthe1 from Battery Used in a Fuji 100s. Purchased on the basis this particular camera seems to have a tendency for the battery to be drained quickly without giving you an adequate warning of an immanent failure. So this led to the purchase of a second battery. Works fine. Does what a battery is supposed to do. In the catalog I received YESTERDAY, the price is $29.33! What's the story?